There was a time when my mind was open and flowing and I had so much to talk/write about. This week there is nothing going on in that mind of mine. I have been crazy busy lately, so by the time I actually get home I just sort of crash. Which could be why there is nothing going on in my brain. Or maybe its just a mini blessing in disguise. I am a person who has been known at times (or all the time) to talk too much, and sometimes I exhibit that really ugly 'foot in mouth' syndrome. There is a verse in the bible about "cutting off the flow of the mouth" and sometimes I'm pretty sure I can see the letters: MEGAN written in front of it. So, I am embracing this new temporary quiet Megan. However, my quietness could be caused by the amount of shame I feel over how much money I have spent on fall decorations so far this year. And please notice that I said "so far". Because even though there is shame, I'm still not done with the shopping. I think Fall decorations are the most amazing decorations ever. wonderful about Harvest and Thanks and PUMPKINS. And I've gone Pumpkin crazy. Usually I just reserve my pumpkin love for those amazing little candy pumpkins that I'm pretty sure are a mix of pure sugar and pure heaven. But this year I have taken my pumpkin love above and beyond food. I visit Hobby Lobby and Kirkland's daily. And the Fall decoration buying has gotten pretty bad. But tell me, could you really pass up this pumpkin platter for TEN dollars? See, I knew you couldn't pass it up. It would be illegal to pass up something this cute for that cheap. And that is exactly what I'm telling The Hubs when he checks the checking account. However NFL officially began tonight so maybe he will still be in Happy Football La La Land to even care. Meanwhile, I will be purchasing more pumpkins. Love them. Too cute! I definitely need more fall decorations! I love pumpkins too! I need to start my fall decorations soon! I am with you- love christmas- but there is just something about fall decorations that I love. I am such a pumpkin girl as well. In face, at this very moment there is one (an itty bitty one) sitting on my table, next to my vase of fall loveliness. Yep I start the pumpkin picking out early. Do you like to eat pumpkin?!! Fall is my favorite eating time of the year!! I share the pumpkin love! LOVE the pumpkin platter! LOVE Hobby Lobby! Can't pass up such cute decoration when they are half off! I also LOVE the fall time. I think it has something to do with cooler weather. I'm always happy to see summer come and then go (I'm tired of mowing my yard every 5 days). And Hobby Lobby...don't even get me started. That place is gonna make me go broke. I love pumpkins and pumpkin smelling candles, yum! Hi Megan-your blog is a crack up, I have enjoyed reading it over the past few months. Your writing style reminds me of a book, "Eat Pray Love" which was also good if you are looking for a reflective read. Fall decor is my favorite too! Last year I purchased a ton of stuff extremely cheap after thanksgiving at hoblob. I can't wait to get it all out!! I am also a huge fun of fall decorations. I love carving pumpkins and all that other good stuff! I love pumpkin too!! Decorations, food, etc...It's awesome! And I'm not even going to decorate this year for Christmas, because of the baby, but I'm going to decorate for the fall and Halloween! Can't wait! I like fall decor, but I definitely do the most damage with Christmas decorations. I always hit the decoration sales after Christmas and then pack them away. So when the next year rolls around, it's literally like Christmas - I find all sorts of goodies that I completely forgot about! I love decorating with Pumpkins! yea, i wouldn't have been able to resist that platter either. i am a sucker for fall decor! LOVE the pumpkin platter! I need to get my fall decorations out! I'm going to do fall decor big time this year. So far, I only have 3 small gourds on display, but that's just the beginning! You absolutely can't beat Hobby Lobby prices...everything is always half off! 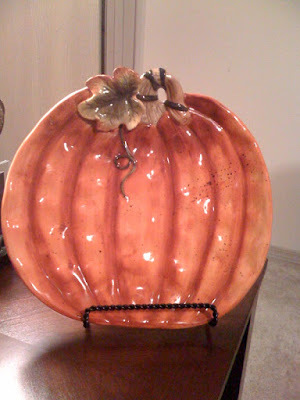 Love the platter...I'm still putting my fall decor out too. LOVE this time of year! I LOVE Hobby Lobby! There aren't any around us, but when I went to school there was one and I went almost everyday after work. You definitely couldn't pass that adorable pumpkin up! This reminds me that I need to get out my fall decorations. I bought Danny some of those Brach's Mellowcreme Pumpkins yesterday. Yummy!